With a reputation for delivering high quality and extremely sanitary portable toilets, hand wash stations and restroom trailers, Texas Waste, Co. is the premier provider of event rentals for the Dickinson community. We cater to businesses, construction sites and special events with same day or pre-scheduled service that will exceed your expectations. At Texas Waste, Co. we understand that businesses need to uphold a level of professionalism, construction sites require sanitary amenities that contribute to a healthy work environment and special events must have a substantial supply of clean porta toilets, hand wash stations and restroom trailers to keep things safe and fun. We own, rent and maintain all of our portable event rentals in-house and always provide enough stock to meet your requirements. 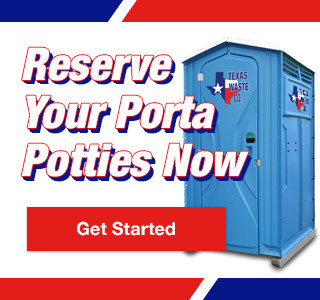 Our friendly customer service paired with the sanitary and dependable condition of our portable toilet rentals make us an easy choice for porta potty brokers who look to companies like Texas Waste Co. to carry out their customer promises. And unlike other companies that service Dickinson, we offer an easy-to-understand pricing structure with no hidden fees so you know exactly what you’re paying for. Contact us the next time you need porta potty rentals, hand wash station rentals or restroom trailer rentals in or near Dickinson, Texas. We’ve been a trusted resource since 1999! The city of Dickinson is located on a parcel of land that was granted by the state of Texas to John Dickinson in 1824. Shortly thereafter, the Galveston, Houston and Henderson Railroad was built to traverse the territory for use by the Confederacy during the American Civil War in an attempt to reclaim Galveston from the Union. In the 1890’s, the Dickinson Land and Improvement Association marketed the area to farmers with claims of superior soil quality for crop growth. In 1905, Italian ambassador Baron Mayor Des Planches sold approximately 150 Italians from eastward Texas towns to Dickinson and in the 1920’s, Dickinson became home to the infamous Maceo crime syndicate which owned gambling venues like the Silver Moon Casino in Galveston. If your looking for the best service and price for porta pots in Dickinson, TX we have them. Dickinson – Porta Potty Rentals Available Now!